THE CRISPY COOK: Continuing Cruciferous Fun: Hot Caulflower Dip! Continuing Cruciferous Fun: Hot Caulflower Dip! Though most everything else in the Crispy Garden has been on the "meh" side in the Summer of 2013 with the weird and wonderful weather patterns we've had, as reported previously, the cauliflower crops has been outstanding. I planted a little six pack of cauliflower seedlings this Spring, hoping for 1 or 2 cauliflowers, but they have all matured and all six have been gargantuan. I have made a lot of cauliflower curries and baked, cheesy cauliflower to use up this bounty, but then my friend Lee tipped me off to Hot Cauliflower Dip. There's cheese involved (great), spinach (awesome) and lots of lightly steamed cauliflower (fan-tabulous!) which gets blended together in the food processor and then topped with more cheese and baked. It's a great way to use up some cauli-bounty and to sneak in some veggies into the summer party spread. I made a big batch of this to bring to our friends' house and it was appreciatively gobbled down. I managed this quick and somewhat unglamorous snapshot before it was inhaled. Steam cauliflower until soft. Drain and let cool. Whiz cooled cauliflower in food processor until smooth. Add in cream cheese, mayonnaise, garlic and salt and pepper. Whiz around some more until garlic is incorporated. 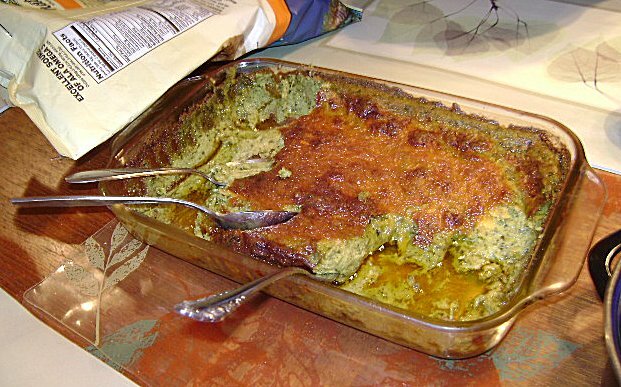 Add spinach and whiz around again. Mix in half of grated Cheddar. Pack into a 13.x 9 glass baking dish. Top with remaining cheese and bake in a 375 degree oven until cheese is bubbling, about 30 minutes. Serve with your favorite chips. Makes about 10-12 servings. I'm sending this recipe over to Weekend Herb Blogging, the weekly blog event headquartered by Cook (almost) Anything at Least Once, and guest hosted this week by my blogger buddy and Cook the Books Co-host, Simona of Briciole. Simona will have a roundup of wonderful vegetable, fruit, flower and herb recipes and blog posts after the August 22 deadline of WHB #398, so be sure to look for that. Haha, that cauliflower is awesome! It's nice at least some of your garden has thrived. That is one honkin' big cauliflower. Love this dip. Great idea! 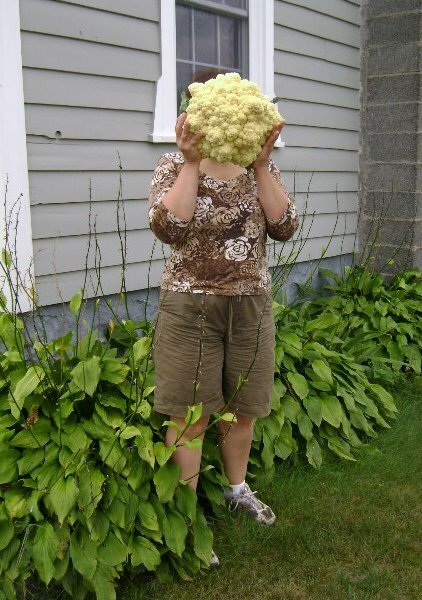 I love that photo of the giant cauliflower! Congratulations on an awesome crop. And thanks for the lovely recipe: I bookmarked it for future reference. Thank you for contributing it to WHB.